When you make a gift to Hope International University, you have tremendous flexibility in determining how the funds will be used, as well as many options for making your gift. 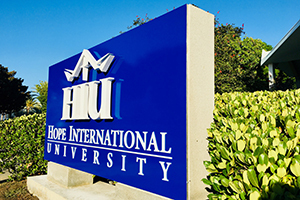 Unrestricted gifts are among the most valuable to HIU, because they allow the university to allocate funds wherever the need is greatest, and to take advantage of unique opportunities as they arise. Your unrestricted contribution may be used to support costs associated with financial aid, innovations in teaching, research, facilities, and much more. Directed gifts allow you to designate your gift to a specific college, a program, or a priority area at the university. When you make a directed gift to HIU, you enjoy the satisfaction of knowing you are supporting a program that is personally meaningful to you. HIU has accounts with major brokerage firms. Have your broker call the HIU Business Office for further details and information. Physical stock certificates may be sent by certified mail or overnight express, with endorsement on the back of the certificate(s) exactly as stated on the face of the certificate(s). Do not fill in any other blanks. No stock power is necessary as long as you do not fill in the university’s name on the back. You also may make a gift of mutual funds, non-marketable stock, or closely held stock. Contact the HIU Advancement Office for information about giving these types of securities. Cash gifts — the simplest and easiest gifts you can make — can be made through secure online credit/debit card transactions, outright cash, personal checks, cashier’s checks, or money orders made payable to the Hope International University. The university also has a wire account; please contact our Advancement Office for details about making a wire transfer to HIU. Gifts of real estate — including personal residences, second homes, income property, and vacant land — offer a wide variety of tax and other benefits. Whereas most people give their entire interest away, it is also possible to give only a portion of the property (an undivided percentage interest) while retaining the rest for other purposes. Gifts of personal property — including rare books, works of art, valuable collectibles, and tangible items of demonstrable value — in some cases may enable you to make a significant gift to support HIU with outstanding tax benefits to you. Likewise, gifts of intangible personal property, such as copyrights, patents, and mineral rights, can generate income for the program of your choice on a continuing basis. To learn about deferred or planned gifts, including bequests, life-income plans, and other options for your estate — and for information about increasing your income, earning valuable income-tax deductions, and reducing your estate taxes — please visit the Planned Giving page or contact the Advancement Office. An easy way to double or even triple your donation to HIU is to find out if your company has a matching-gift program. Such programs typically match all or a percentage of employee contributions to charitable organizations, making the employer a partner in employees’ personal philanthropy. Simply obtain a matching-gift form from your employer’s personnel office, fill it out, and provide it to HIU with your contribution. HIU welcomes your gift through a pledge — a formal statement of intention to make a gift to the university. With a pledge, you may complete your gift by making regular payments over time, allowing you to give more generously than you originally may have considered. What is more, each payment on your pledge is eligible for an income-tax charitable deduction.